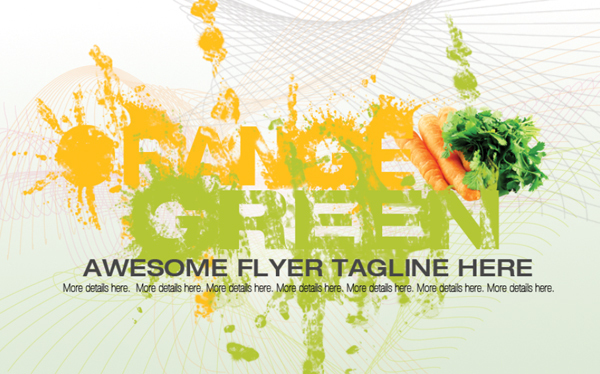 In this tutorial, you will learn how to add special splattered effects to your flyer titles. This will help you achieve that solid to liquid-styled text for a more interesting and unforgettable effect. The good news is that it is not that complicated to do this. With just Adobe Photoshop, some free images and of course a little design determination, it is easily possible for you to do this effect, even if you are an amateur. All you have to do is follow these step-by-step instructions. Now, for this guide, we will go through everything from the start to the finish of the flyer. This will get you that print ready finish for this design. So let us get started. First, let us setup the flyer document itself. It is possible to set dimensions customized to the flyer size that you need. However, it is usually better for you to stick to standard dimensions to make things easier on you in terms of printing and mass production. In this guide, we are setting our canvas to have half the dimension of a letter-sized flyer. This is a good standard printable flyer size to work with. 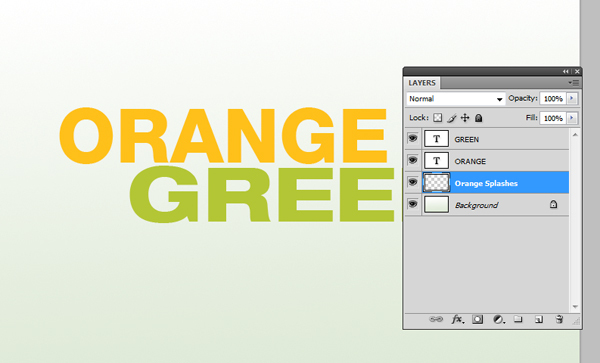 Here are the specific settings you will want to set once you create your document in Adobe Photoshop. Then, we setup our base background. While using a white background is actually perfect if you want your splatters to be colored, using just a plain background color can be a bit boring. It is better usually to add a subtle variation of color as this actually makes the design look more “natural”. 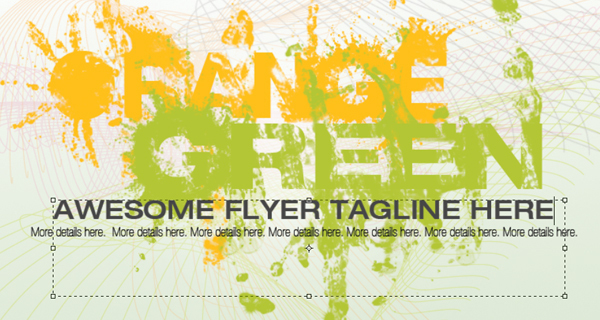 So use the gradient color tool and use a white to off white linear gradient to set our flyer background. Then, we type in our flyer text. 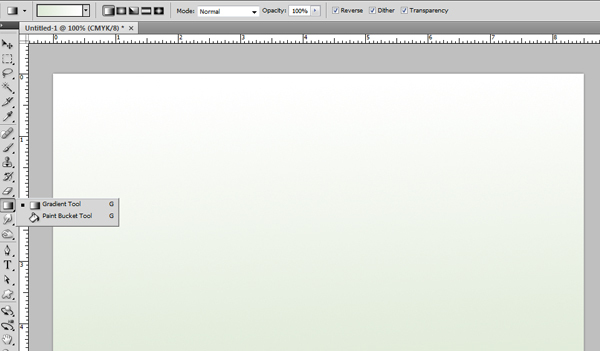 In this example, we will be typing our main title text. We have typed in two words in two different colors. It is best to use a thick type font style in the sans serif family. Here we are using variations of Helvetica Neue. Next, create a new layer by pressing CTRL+SHIFT+N. 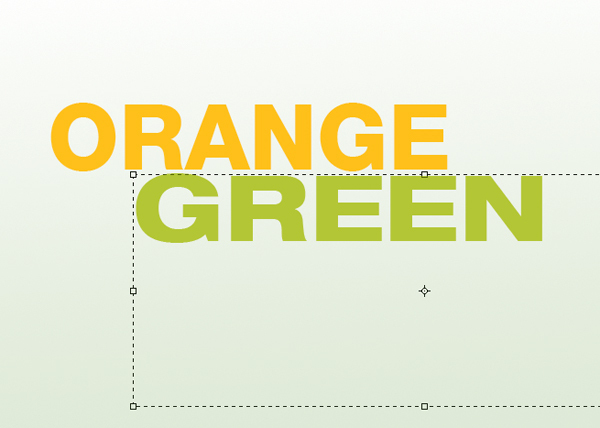 Name this as the Splash layer for our orange text. 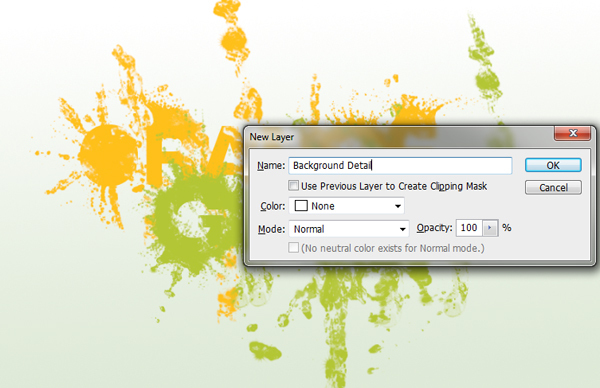 Drag this layer below all the others in the layers panel. We shall now add some splash brushes for Photoshop. In our example, we downloaded some nice and free water splash brushes from this generous person in Deviant art (http://xresch.deviantart.com/art/38-Water-Splash-Brushes-199048936). 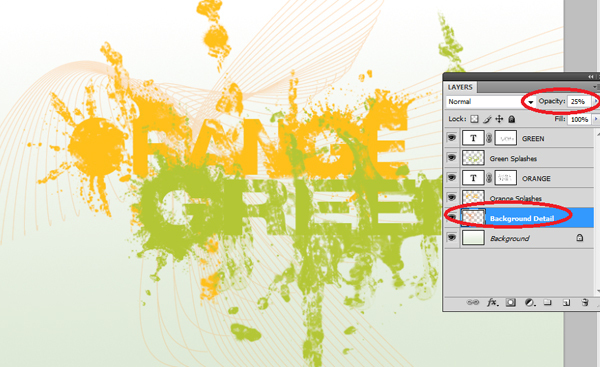 Once downloaded, we select the brush tool in Photoshop and then right click on our newly created blank layer. The brushes context menu should open. Click on the right arrow and select the “load brushes” option. Select our newly downloaded brushes. 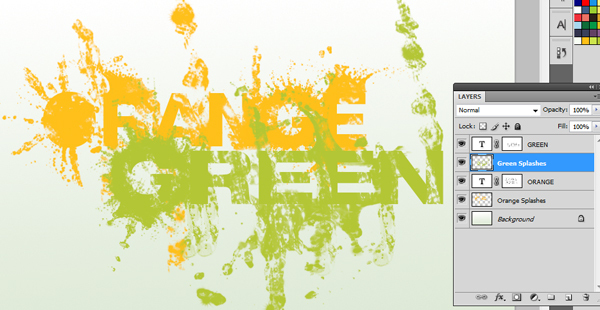 With the brushes loaded, we use the same orange color and then use the various brushes to make the text look like splatters and splashes. Now, we will add some added effects to the text itself. First through we shall add a layer mask. Select the text layer and then look for the “add layer mask” icon. 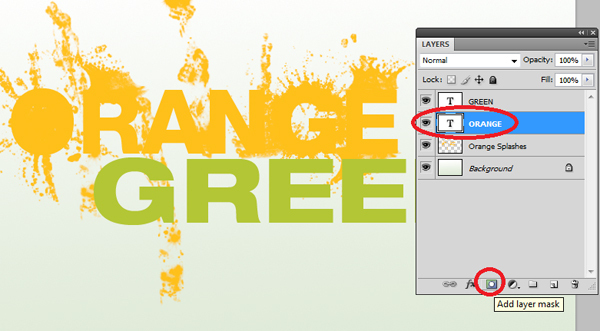 Click on it to add a layer mask to our text layer. Then, change your brush color to black. With the layer mask selected, select a few more splash brushes and then tap some light spots on the text itself. You will see that the text gets erased a bit in the shape of your splash brushes. The great thing about the layer mask is that it does not mess up your text and you can always go back and change it. Great! Now, we repeat the whole process for the green layer. 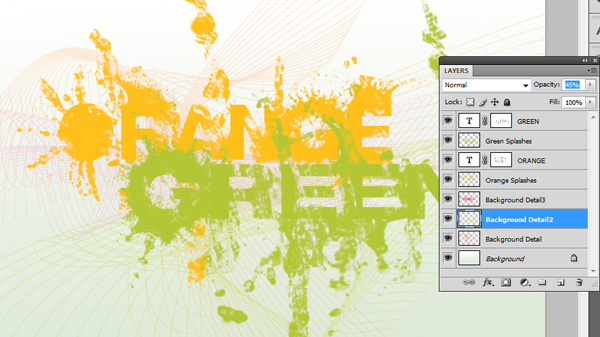 We create another blank layer just below the green text layer and splash in some green brushes. Then, just like the other text, we add a layer mask and use black brushes in the layer mask to make the text layers themselves look a bit distorted in the green layer. Now, we will add some extra details on the background. We again turn to some free resources to do this quickly. In our example we got some great line style brushes from another generous person in deviant art here (http://viniman.deviantart.com/art/Lines-77566768). Just download and install this brush like before. Then, create a new layer and name this Background Detail. Position this just above the last background layer. 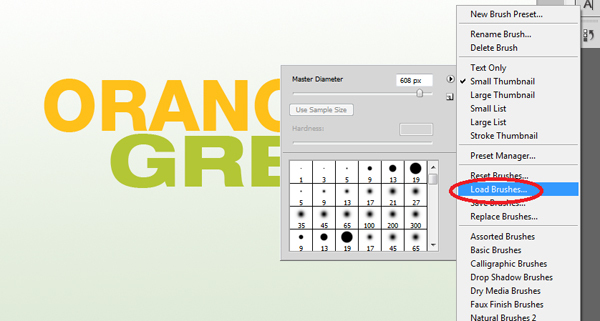 Afterward, select the brush tool in the tools panel once again. Select our texture lines brush that we just installed. Using a theme color, place one or two of the brush shapes into the canvass. 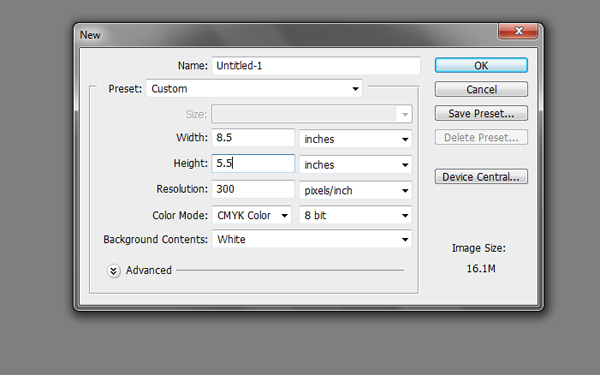 Take note that you can resize the brush using the brush context menu. Just right click and make your adjustments in the menu that appears. If your color lines are too vivid or intense, you can try lighter colors or you can also just reduce their opacity value. 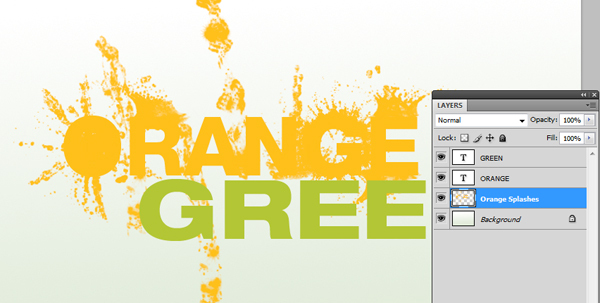 You can do this easily via the layers panel. 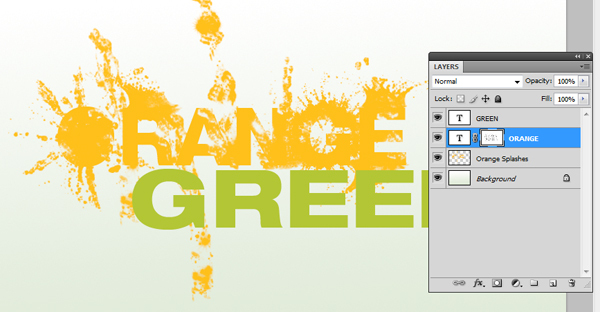 Simply select the layer in the layers panel and adjusting the opacity slider on the top right to around 25%. Then, we just repeat the process to add a few more extra line textures. 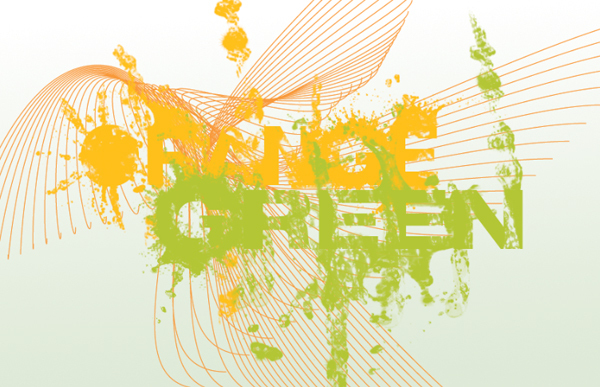 We varied the colors and the opacity value to get a more interesting effect. It will be good to have one slightly darker color here if possible, a dark grey, to make some of the lines more distinct. Press CTRL+SHIFT+N again to create another new layer. Drag this new layer on top of our line layers. Then using a soft and medium sized brush we paint a white spot just at the center. We reduce the opacity of this white spot layer just a bit to 80%. This negates some of the intense details of the lines at the center. Finally, we of course add the rest of the text needed for the flyer. Of course, this means using a smaller font size. In terms of font style, it is better always to use Sans Serif family fonts here so that they are easier to understand. Also, do not use the same colors as your main title here. Use something dark, such as a dark grey or even a full black for the text. This helps them look more distinct and of course a lot more readable. Great! Now technically the flyer is done with those typographic styles. However, to make things more eye-catching, we paste in a feature image. 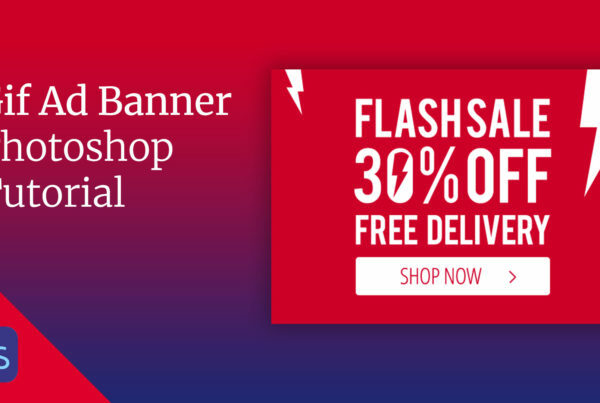 Think of this as your main promotional product. Just adjust the size appropriately by pressing CTRL+T with the image selected and then dragging the anchor lines as needed. Great! With that, our design is finished. 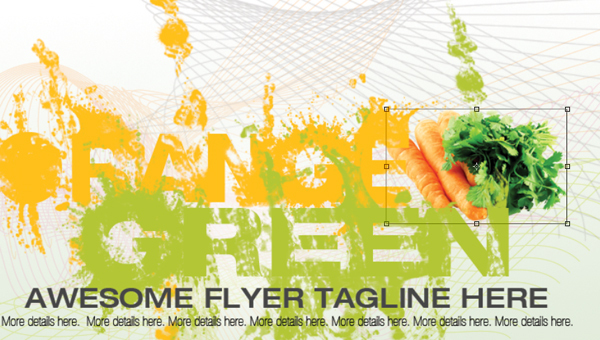 We now have a nice splattered flyer design with some great texture elements thrown in for great promotional effect. Use the tricks you learned here for your own splatter design styles. Good Luck!